There are those who say that if you make a sequel to a bonafide classic that you ruin the original. I have heard this said all throughout my life, but have it the most in the last fifteen years. In fact, Tarantino, who was asked to name his favorite films since his first, Reservoir Dogs was released. He said that he wouldn’t rank them (although he said that Battle Royale would be number one. ), but he did say that The Matrix would be number two on the list if it had not been for the sequels, The Matrix: Reloaded and The Matrix: Revolutions. He said that they ruined the mythology for him. Getting back to the sequel talk: the camp that argues that classics should not have sequels are as full of it as the people who say that sequels (or remakes) ruin the original. Take for instance Psycho II. Psycho II was released in 1983, 23 years after the original Psycho. Psycho is a classic, there is no denying that, but there are people who stayed away from the theater saying that Hitchcock was rolling over on his grave. What those naysayers didn’t realize is that Hitchcock remade The Man Who Never Too Much from his own original. There are plenty of directors who have remade films. Most people don’t know that they are remakes. If they did would they look down on the film? Who knows. Now, on to Jaws 2. Jaws is and will always be a classic. The film is a masterstroke in filmmaking. Steven Spielberg knew exactly what he was doing with Jaws (even if the production was a mess). He made a big Hollywood monster film. While Hollywood was off making disaster films, Spielberg was making a B-movie. Everything in the film is A-level, except for the subject. No one made B-movies at the studio level. Spielberg did and, afterwards, so did Hollywood. A sequel to Jaws seems like a natural thing now. If a hit film doesn’t have a sequel now we think that there is something wrong with the original. 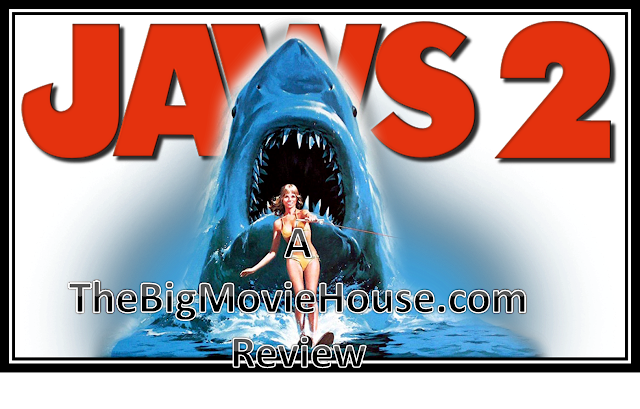 Jaws 2 was a gamble, but it paid off. 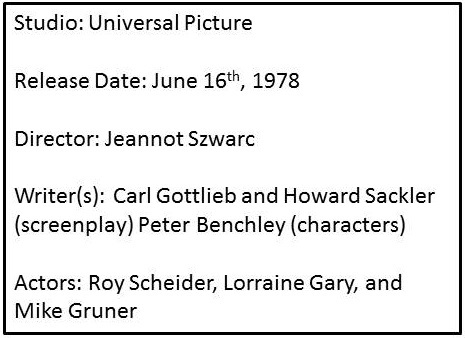 Jaws 2 picks up a few years after the first film. Brody is still the sheriff and life is good. His wife is working for a big land developer who wants to turn Amity into a tourist attraction. Two divers are killed and then, in a separate incident, a mother and her water skiing daughter are killed when the mother tries to light the shark on fire, but ends up blowing herself up. Brody thinks that it is a shark and he is fired, even though he has proof of a shark, when he opens fire at the beach when he thinks that he sees a shark. Soon his kids, along with a bunch of other kids, are stranded off shore by the shark and Brody has to go save them. The story is not bad at all. It is nice to catch up with Brody again and we see that his kids are growing up. He is a protective father and wants to do right by them. He also loves his wife very much and will do anything for her. The film adds to Brody the fear of another shark attack. He knows that there is another shark out there, but no one will believe him. You would think, after the events of the first film, that Brody would be believed. Nope. He is fired for the beach incident, but still ends up saving the day. The mayor in the two films is a terrible mayor. He should have been taken out of office after the events of the first film. You would also think that he would have changed, but he is still the same S.O.B. as he was before. The film was directed by Jeannot Szwarc, who worked primarily in tv. He directs the film like an action film, which it really is, but he pales in comparison to Spielberg. I know that sounds like something that doesn’t have to be said, but it is true. While Jaws was more about the town and the three men on the boat, this film is more about the shark. We do get some nice character moments, like when Brody thinks he sees a shark at the beach. I mentioned the scene before, but I did not talk about it much. It is an important scene and the Szwarc handles well. There is also a scene where Brody and his wife find Miss Amity out in the middle of the ocean. She is hidden underneath the front of the boat and is paralyzed with fear. A few scenes earlier, we saw that she was in the boat with a guy and the shark attacked the boat. The guy was killed but she was spared. I think that this scene is important because it shows how others are affected by the shark. Her fear is deep and that is how some victims would respond. The actress’ acting is realistic and sad. We feel for her. The power of this scene is taken away a few scenes later. Another girl survives an attack and starts to shiver and cry and scream. This actress, however, hams it up. Her reaction is the exact opposite and doesn’t fit in with the rest of the film. John Williams is back again to score the film. I did not talk about him in my review for the original Jaws. Williams, of course, came up with the iconic “duh-duh” score for when the shark is near. That is a classic piece of film scoring, but the rest of the score feels like it belongs in another film. I know that I am going to get a lot of flack for saying that but it is true. I feel that Williams knew this and his score for Jaws 2 fits the film better. There is just something off about the original score that I think is fixed here. Jaws 2 is a good film. It is not great and has its fair share of problems. Audiences loved the film when it was released. Sure, it made a fraction of what the first one did, but that fraction is still pretty big when the whole is one of the highest grossing films of all time. I had fun watching the film. It is totally predictable and the film does not always have a good rhythm to it, but it is still a fun ride.